Lifesource Yoga Summer Series For Children! “Humble Humanity” is the second of the Lifesource Yoga Summer Series For Children. These sessions are recommended for ages 7-12 and offers a refreshing change of pace from many of the summer children’s activities out there. 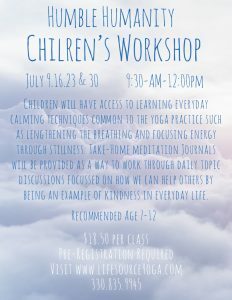 In these sessions, children will learn everyday calming techniques common to yoga such as mindfulness in poses, lengthening of breath and focusing energy through stillness. Underlying ideas for the sessions will include self-respect, respect for others and the importance of community in an atmosphere of kindness. Participants will each be given a take-home meditation journal as a way to work through discussion topics. This series of workshops will take place on July 9th, 16th, 23rd, and 30th from 9:30 AM to noon. Cost is $18.50 per session. Pre-registration is encouraged through our website by using the “Schedule & Classes” tab or call the studio at 330-835-9945.